The coldest period of the year is called ‘Kan’, meaning midwinter. We have another expression for this time of the year as ‘Kan no iri’, meaning entering midwinter. ‘Shoukan’ used for this term is ‘Kan’ which is ‘shou’, ‘shou’ meaning small or less. Therefore the meaning of Shoukan is less midwinter, telling us that midwinter has arrived followed by ‘Daikan’ meaning big or more ‘Kan’ next. Still, comparing ‘Shoukan’ and ‘Daikan’ by the words and the term themselves, ‘Shoukan’ should be less cold than following ‘Daikan’ but there is a unique phrase as ‘Shoukan no kori, Daikan ni toku’ meaning that the ice formed in Shoukan melts in Daikan. This expresses that Shoukan is colder and harsh than Daikan which could be because people are not so used to the cold weather in the beginning of midwinter coldness. The phrase also has a meaning of things not going or flowing in order. Winter greetings called ‘Kanchu mimai’ start from this time of the year. This seasonal greeting is made by sending postcards to those you love and care but is more done by those who refrained from sending New Year greeting postcards on New Year because in mourning nowadays. ‘Kanchu mimai’ gifts are also sent as return gifts of ‘Oseibo’ (a custom in Japan at the end of the year, paying ones respect and thanks by calling on with gifts or sending gifts) or New Year gifts. Tokyo recorded the coldest this morning. The temperature went below freezing last night turning tiny puddles on the pavement frozen. The cold weather at this time of the year even abandons the runaway who was in pursuit of the police, an affair of a suspect’s escape which happened few days ago caught tired of escaping in frozen river. Compared to heavy snowing countries or countries with lower freezing temperature, Japan’s winter is not that harsh but if we look at the records of the past on our ancestors’ food, clothing and shelter, the coldness at this time of the year should have been much harder than how we feel today, much longing for the arrival of warm spring to come. Today’s phrase expressing this time of the year is about ‘spring’, a natural flow of the ground water. 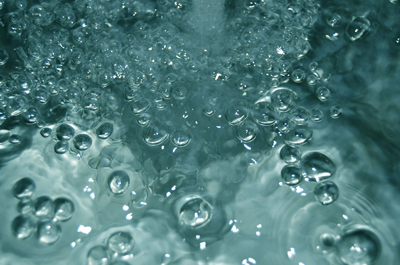 The first word ‘Suisen’ means the water of the spring, followed by the verb ‘ugoku’ meaning to move. It is translated as the spring water starts to flow or stream out though what we actually see outside at this time of the year are frozen which doesn’t make sense if we took the words as they are. The springs here are springs down deep below the ground where terrestrial heat is influential. You cannot see this effect directly through your eyes nor did our ancestors had evidence of proving that the frozen spring water actually activates at this time of the year deep under the ground but have believed that it did because they wanted to get away from the cold, freezing weather hoping that warm spring is drawing near, day by day. Frozen spring water deep under the ground should be melting now and starts flowing…. 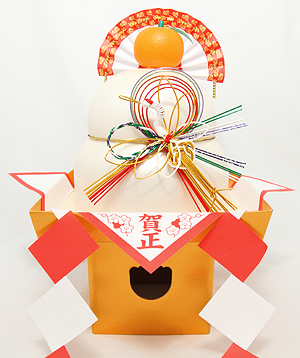 Two flat round-shaped rice cakes piled up with bitter orange placed on top in New Year is called ‘Kagami mochi’. This decorated piled rice cakes is a traditional New Year offering and yorishiroW, an object representative of toshigamiW, the year god. 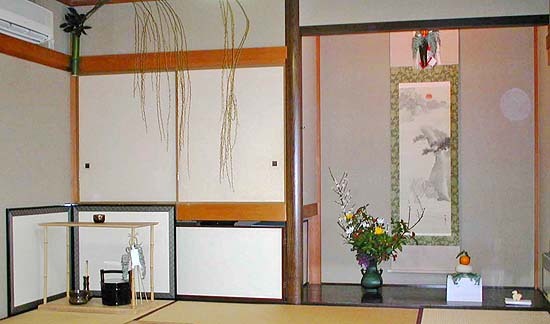 Kagami mochi is usually placed on tokonomaW, a sacred space usually set in the house (but many new and modern houses don’t have tokonoma nowadays), or at some place higher and clean during New Year’s ceremonial period, ‘Matsu-no-uchi’. Matsu-no-uchi is a period when the year god, Toshigami, stays, placing him/her self on the Kagami mochi which ends on 7th January or later in Western Japan, on 15th when he/she leaves. After the departure of the Toshigami, his/her accommodation, or the Yorishiro which is the Kagami mochi is removed. The rice cakes are believed to have power of the Toshigami as they were the dwellings of the god and are eaten by family people taking in the god’s power which should bring luck and health. Kagami mochi placed on ‘Tokonoma’. Photo from Rurikon. ‘Kagami’ literary means mirror which were named on such rice cakes because the rice cakes had the shape of how the ancient mirrors of Japan were like. Mirrors of the ancient in Japan were used mostly for religious ceremonies which traces still remain as sacred mirrors you see in shrines now. ‘Hiraki’ is a noun meaning the opening which has been used as a substitute word of cutting or breaking because the ceremony was started by bukeW, samuraiW families and that the words as ‘cutting’ or ‘breaking’ would remind and bring in the negative forces from seppukuW and the ruin of the family. 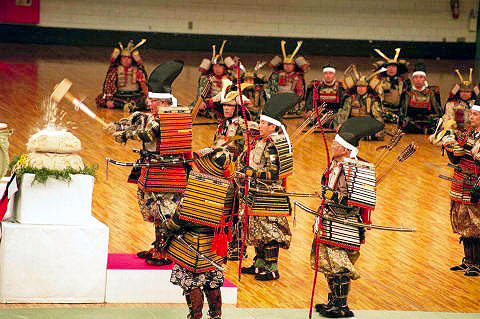 Opening also combines with the custom of samurais who had their amours kept in their coffers, first opening after the Toshigami left as well as the image of the word itself, opening of the New Year’s start. Representation of ‘Kagami Biraki’ in age of civil wars in Japan, held by Chiyoda ward, Tokyo. Photo from ‘Tokyo no matsuri‘ by Eiichiro Kondo. The Kagami Biraki is on 11th January ( in some parts of Japan either on 15th or 20th January), removing the Kagami mochi from the alter, Tokonoma or sacred places of the house and not cut but broken by wooden hammer. The tradition of breaking the mochi and not cutting refers again from avoiding the image of seppuku. As the Kagami mochis are packed in plastic cases nowadays, mochis don’t turn hard and stiff being decorated through the Matsu-no-uchi period, which are hard to break with hammers. There are interesting tips introduced in some of the Japanese sites concerning how-to-not cut but turning Kagami mochi into pieces fit for your mouth size. The simplest way is to tear them into pieces with your hand. ‘Don’t break or crack me! 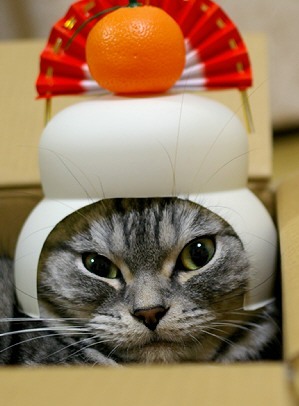 !’ Photo from ‘Amesho-ssu!‘ by Momo-nyan. For reference, ‘Kagami Biraki’ also points out a ceremony for opening the sakeW, Japanese rice wine, cask with wooden hammers and treating the guests with the sake on auspicious occasions as completion of the new built houses, the anniversary of when something was established or on weddings. It is called so because the lid of sake cask is round and is called ‘kagami’. The image of this custom would be like the Guy Fawkes NightW without fireworks and different backgrounds in UK. The festivals held concerning this custom around Japan are usually small, village or town unit size, mainly thought to be a festival with children’s participation. The festival is held on either in the evening of 14th January or in the morning of 15th January in a rice field after reaping. Three or four tall bamboos are posted with straws where you place decorations used in the New Year. Fires are lit on the heap, burning the decorations. 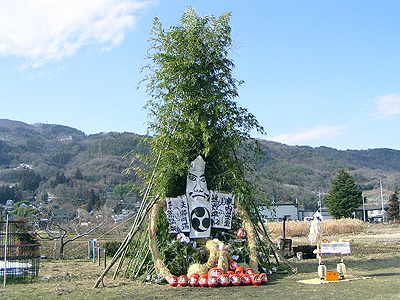 Bamboo outlined bonfire built with New Year used decorations. Photo from ‘Kisetsu no wadai (Municipalities in Nagano prefecture)‘ by Shinshu kara anata e.
The origin of this festival seems to have started around in Heian periodW in the Imperial Court, an event held by the court diviner, Onmyo-ji, burning fans and strips of rectangular shaped papers with poems and oracles on a bonfire made from outline of sticks used for New Year ball game, ‘Gicchou’ and chiromanced the year by the bonfire. The custom gradually spread to the public connoting with Buddhism teachings of seeing the year god, Toshigami, off who visited and stayed during New Year like lighting a bonfire on Bon FestivalW seeing the dead ancestors off to their other world who came back. 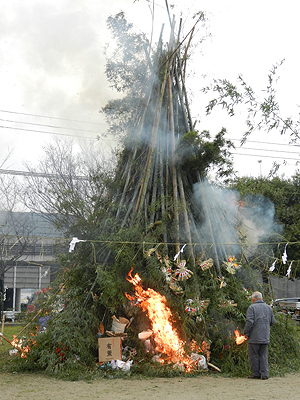 Bonfire of Dondo Yaki being lit. Photo from ‘General Incorporated Association, Minori-kai‘ official site. You could see some of these festivals all around Japan at this time of the year in the country side, some really big and exiting. Those living in big cities have no chance to take the used decorations to get burnt in the Dondo Yaki would wrap the decorations in clean paper or newspapers with pinch of salt as a meaning of purification would put it in their garbage bag on the day.